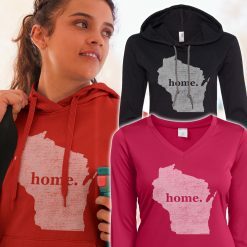 Super comfortable Womens Wisconsin Home T-Shirts that ladies love to wear. Our unique designs are sure to please and are always great conversation starters. 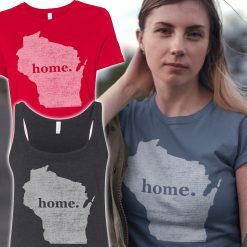 Our Womens WI Home T shirts, apparel, clothing and gear make great gifts for Valentines, birthdays, Mother’s Day, Christmas and more.